When the Shoe Fits… is LIVE!!! 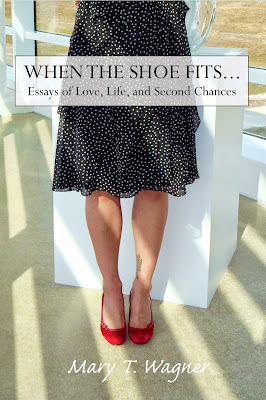 Announcing that my new book, “When the Shoe Fits…Essays of Love, Life and Second Chances” is LIVE on Amazon, with some great reviews and a book club “Discussion Guide” in the back of the book. So check it out and read the preview!! After more than seven years of writing essays at my Running with Stilettos blog (good grief, time really flies when you’re having fun…), I compiled “When the Shoe Fits…” as a “best of” collection of my favorite essays from my earlier three books and a few other places around the web. “When the Shoe Fits…” is available both as a Kindle edition (and remember that Amazon has a zillion free apps that let you read Kindle books on other devices like iPads) and in paperback. And if you buy the paperback version from Amazon, you can get the Kindle edition free! If you’d like to check it out for a possible book club pick, email me for a PDF review copy to do a “test drive”! And by all means check out a couple of guest posts I did as part of the book launch. There’s one at MORE.com, “Reinvention Lessons from the Trenches,” and another at Imperfect Women.com, “The DIY Cover Shoot.” And I even got tagged in a blog tour.